Seagate FreeAgent GoFlex USB 3.0 upgrade cable and Seagate FreeAgent GoFlex FireWire 800 upgrade cable are two of the upgrade cable kits or Personality Cables that Seagate offered as flexible upgrade option for ultra-portable hard disk drives in GoFlex family of storage systems (but not GoFlex Desk drive). The upgrade cable kit contains the interface adapter with circuitry to convert the internal hard disk’s bus interface native signal to serial bus communication protocol understandable by host controller such as computer, with the appropriate connector. Retail packaging of the FreeAgent GoFlex upgrade cable kit. Seagate FreeAgent GoFlex USB 3.0 Kit content with ExpressCard 2.0 to add USB 3.0 port to notebook computer. There is also version without the ExpressCard. 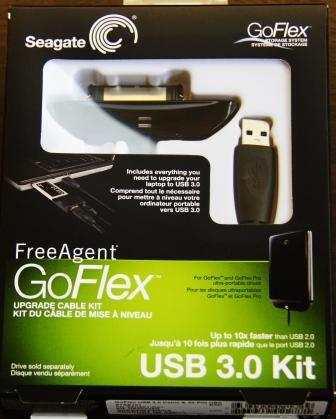 Seagate FreeAgent GoFlex FireWire 800 Kit content. The Seagate FreeAgent GoFlex USB 3.0 and FireWire 800 upgrade cable fits nicely into a GoFlex or GoFlex Pro ultra-portable drive. Both has 18-inch (43 cm) long cable, which is nondetachable, so user who needs a longer cable will have to stuck with existing length, or use an extension cable. 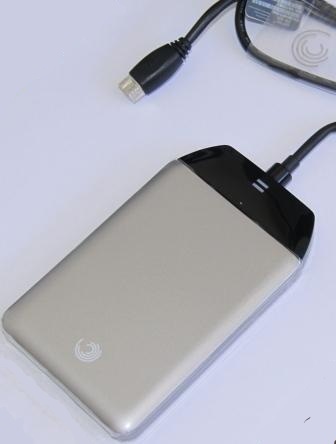 To match with new design of FreeAgent GoFlex ultra-portable drive, which does not have any LED lights to show disk activity, the interface adapter also has LED lights. 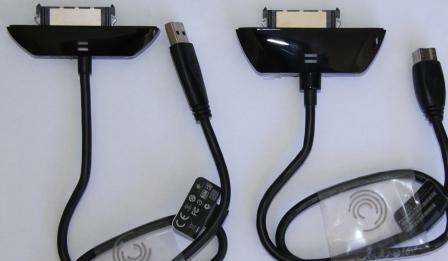 In addition, so far, I only manage to see the upgrade cable kits that are in black color. Left if USB 3.0 kit while right is FireWire 800 kit. Note that the FireWire 800 cable upgrade kit is fatter, which makes the portable drive longer. 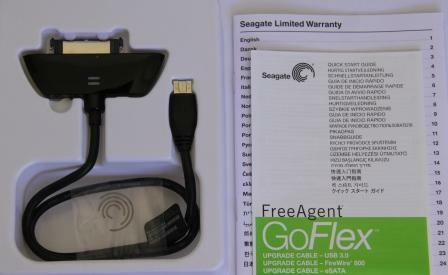 Seagate FreeAgent GoFlex USB 3.0 upgrade cable requires a USB 3.0 compliant port on the host computer in order to achieve fastest data transmitting speed possible. USB 3.0 is backward-compatible with USB 2.0 port (USB 2.0 and USB 3.0 is using the same cable and connector type, with USB 3.0 port color-coded with blue), which is now de-facto standard of personal computer, but the data transfer speed and bandwidth will be significantly slower when comparing with USB 3.0. Seagate offers two FreeAgent GoFlex Upgrade Cable Kit to USB 3.0. One includes ExpressCard 2.0 for USB 3.0 with a USB power connector, and one another without, just comes with the USB 3.0 interface adapter for GoFlex drive with a USB 3.0 cable. The packages allow people who wants to upgrade to USB 3.0 an easy path. 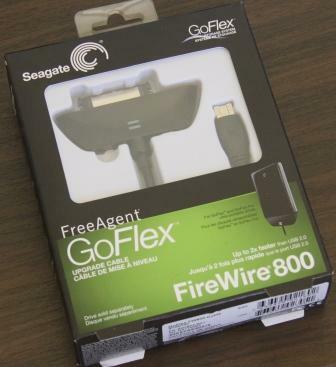 Seagate FreeAgent GoFlex FireWire 800 upgrade cable requires a 9-circuit beta connector (IEEE 1394b), which is currently not yet popular on PC and mostly only available by default on Mac OS X systems. It’s backwards compatible to the slower rates and 6-circuit alpha connector of FireWire 400 (IEEE 1394a). However, even if the computer has the port (where most no), user will need an adapter or converter to plug in 9-circuit beta connector to 6-circuit alpha connector. Most laptop or notebook computers provide miniature 4-circuit i.LINK connector which omits power supply cables. Unfortunately Seagate FreeAgent GoFlex FireWire 800 upgrade cable does not accept external power source, causing the computer does not detect or recognize the drive when plugged in even if the user has the FireWire 800 adapter. 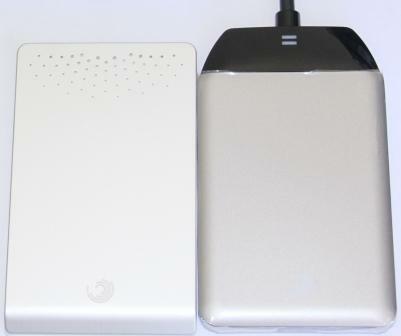 Seagate promises FreeAgent GoFlex external hard disk drive data transfer performance will be significantly improved with the upgrade of cable kit, with USB 3.0 will provide up to 10x faster than USB 2.0, and FireWire 800 (IEEE 1394b) will be up to 2x faster than USB 2.0. Theoretically, USB 2.0 can have maximum throughput of up to 480 Mbit/s (60 MB/s), USB 3.0 can have maximum throughput of up to 4800 Mbit/s, often round up to 5.0 Gbit/s (600 MB/s), while FireWire 800 can achieve theoretical maximum throughput of 800 Mbit/s (100 MB/s). In reality, due to protocol overhead, the actual real-world throughput or transfer speed is much lower. Here’s we put the three different technology into test – USB 2.0, USB 3.0, and FireWire 800 (only transfer speed based on file copying as I don’t have a FireWire 800 connector compatible port on PC). 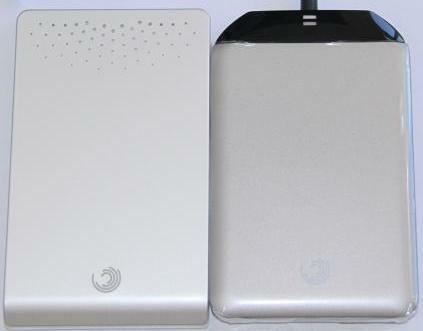 All tests is using the same 500 GB Seagate FreeAgent GoFlex Ultra-Portable drive. The difference is only the change of interface adapter. Note: The test was performed on a MacBook Pro machine. As seen from the result above, the availability of USB 3.0 and FireWire 800 connection definitely boost the data transfer speed between host computer and the external hard disk drive. Both USB 3.0 and FireWire 800 more than double the bandwidth throughput of USB 2.0. However, USB 3.0 throughput does not even manage to triple the USB 2.0 throughput, not to mention the 10x speed boost that the technology promises. I may think that the limitation may due to physical hard disk read and write speed, and the fragmentation may play a part in throughput too, especially in high speed. I had yet to encounter any file corruption while copying when using any type of interface adapter, except during the very initial first change of interface adapter from USB 2.0 to USB 3.0, where the MBR (master boot record) was lost or corrupted, and the whole portable hard disk had to be repartitioned and reformatted. So the technology of higher speed bandwidth throughput of USB 3.0 and FireWire 800 should be quite mature, and reliable. Seagate FreeAgent GoFlex USB 3.0 Upgrade Cable (aff) costs $22.82 on Amazon (FreeAgent GoFlex USB 3.0 Upgrade Cable Kit with ExpressCard (aff) costs $61.17, while Seagate FreeAgent GoFlex FireWire 800 Upgrade Cable (aff) costs $31.40. 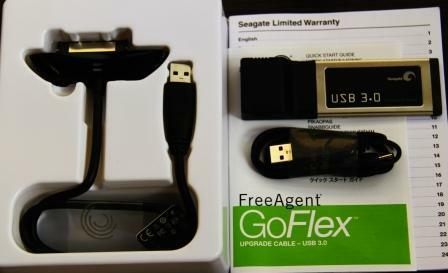 The upgrade cable kit itself does not work without a FreeAgent GoFlex ultra-portable drive. So the cost of the FreeAgent GoFlex ultra-portable drive has to be taken into consideration. 500 GB Seagate FreeAgent GoFlex (aff) has the price tag of $89.99. With USB 3.0, total price tag is 112.91, while FireWire 800 costs 121.39. The price is about the same or even cheaper than USB 3.0 and FireWire 800 external hard drive from other manufacturers, yet giving users flexibility of interchanging with USB 2.0 interface. USB 3.0 and FireWire 800 gives a nice boost in transfer speed from and to external hard disk drive. The higher speed is definitely very useful and time saving for people who always copying or transferring big files or files in large size to and from external hard disk drive. Thus, the FreeAgent GoFlex upgrade cable kit is definitely a recommended buy for people who already has FreeAgent GoFlex Ultra-Portable drive, or decides to get a USB 3.0 or FireWire 800 powered external hard disk drive.